This is one of my favorite winter dishes, which I make in many variations. 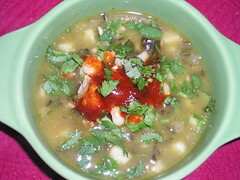 This one was made with cubed pork shoulder, green chilies, and hominy. Then I got ambitious and soaked then puréed some dried guajillo peppers, for just a touch of red, inspired by this website. I also took the trouble to buy cilantro, which really sparks the flavor, but of course, if you dislike cilantro, no worries. And the green chile in this case was a real find, fire-roasted chopped poblano peppers from Wegmans!